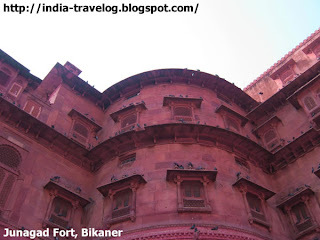 The most prominent attraction in Bikaner is undoubtedly the Junagad Fort. 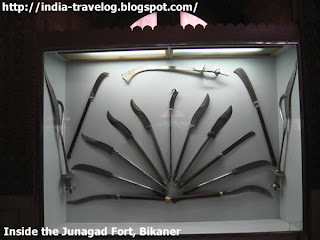 The first place our travel guide took us to was this fort. 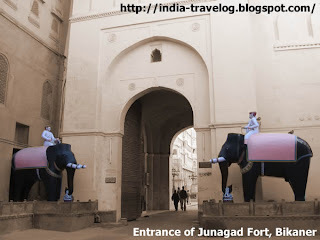 The Junagad Fort, surrounded by a towering wall and a moat makes for an imposing structure. The Fort has never been conquered. 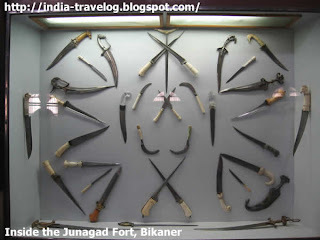 Raja Rai Singh, a general of the Mughal emperor Akbar, built the fort in 1593 A.D. 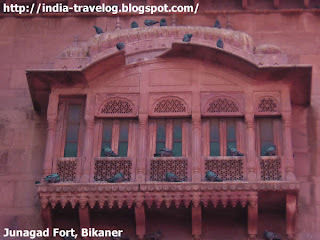 The fort was built using red sandstone and has elegantly carved windows and balconies. the Suraj Pol, also known as the “Sun gate”. Near the main gate you can see the majestic statues of the two guardians of the fort - Jaimal and Patta. 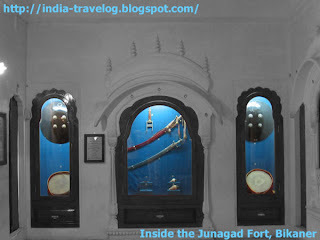 The Junagad fort complex houses a number of palaces within. 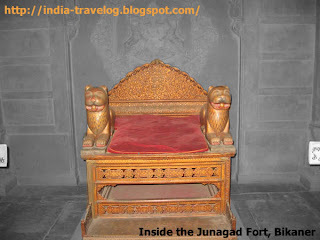 Each of these palaces have been built successive kings and one can notice the distinct style of each era. The Chandra Mahal (The Moon Palace) with its carved marble panels, mirrors and dazzling paintings is the most beautiful of all. Phool Mahal – It is a coronation hall decorated with beautifully cut glasses and mirrors. 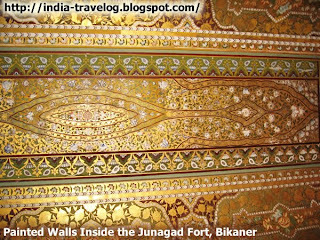 Karan Mahal - was built to commemorate the Rajput’s victory over Aurangzeb. 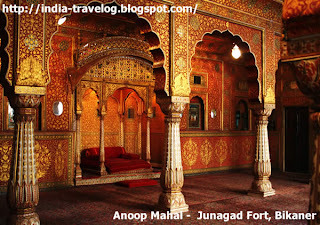 Anup Mahal – the multi storied Mahal has walls covered with red and gold lacquer work. It looks so beautiful when the lights are lit. 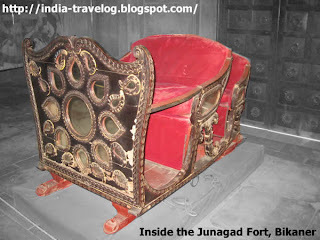 This was used as the governance chambers. 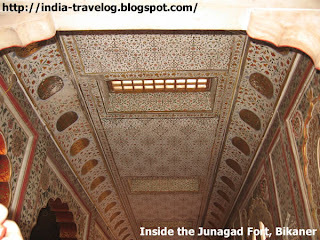 The Badal Mahal (The Cloud Palace) is known for its painted walls that show a painting of Radha-Krishna surrounded by the blue clouds. 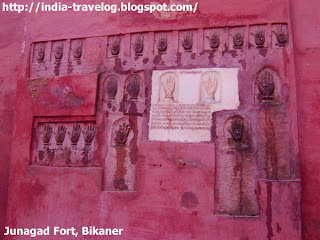 Har Mandir is the place used by the royal families for worshipping. 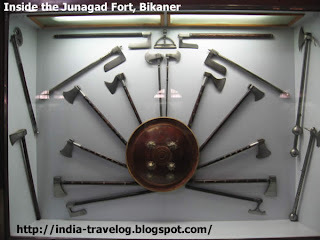 There is also a museum inside fort. On display, here is a magnificent collection of manuscripts, jewellery, arms etc. There is also a Haviland plane on display here. 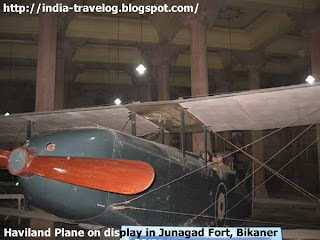 Among the many war souvenir that the British Government presented Maharaja Ganga Singh of Bikaner with in recognition of the services rendered by the Bikaner state forces led by him during the First World War, were the shot down parts of two Haviland War planes. 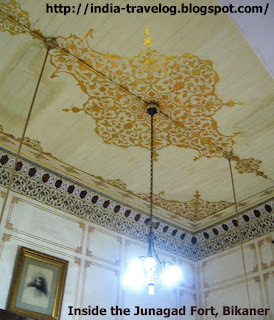 Maharaja Karni Singh with the help of the local artisans got the broken parts of the Haviland plane restored. 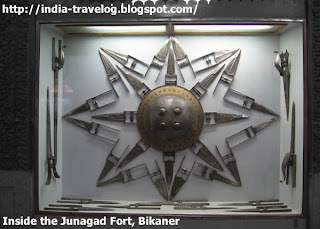 He then put it on display in the Vikram Vilas Durbar in Junagad Fort.